Please call, write and tweet your Senators NOW and tell them that decency demands a NO vote on House Joint Resolution 69/Senate Joint Resolution 18. CALLS: Find your Senators' phone numbers HERE. It is best to call one of the local offices, rather than the DC office. Tell the staff member who answers that you want your Senator to oppose the Senate equivalent of House Joint Resolution 69 which governs hunting regulations on National Wildlife Refuges in Alaska. (** BONUS: save these numbers in your phone contacts to make it easier to call in the future). I am horrified by House Joint Resolution 69 which would allow inhumane hunting practices, such as bear baiting, trapping, killing wolves and coyotes in their dens, killing bear cubs with mothers, and shooting bears from aircraft. These outdated, barbaric hunting methods have no place in our National Wildlife Refuges. Common decency demands that you vote NO on the sister regulation in the Senate. LETTER TO THE EDITOR: Consider writing a Letter to the Editor of your local newspaper. If you have written a personal letter to your Senator, it can likely be turned into a Letter to the Editor with little effort. This tool from Endangered Species Coalition will help you find your local papers. Please let us know if you get published! 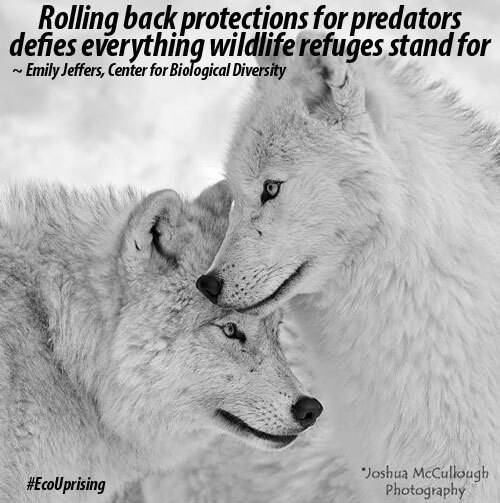 I oppose House Joint Resolution 69 and Senate Joint Resolution 18 which would allow barbaric hunting methods in federal wildlife refuges in Alaska. Decency demands that you vote NO on the sister resolution in the Senate. 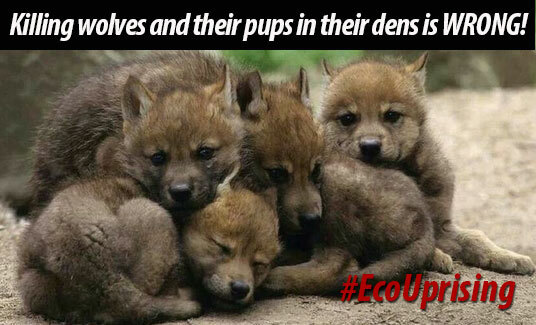 Killing wolves and their pups in dens is wrong! Stop the madness! They want to live too! its not just wrong its ignorant and quite frankly genocidal when you understand that without Gray Wolves there can be no balance or diversity nor sustainability within the natural world and many many people count upon deer and elk to feed their families what will you feed them when the deer and elk are gone?.. This is atrocious to even contemplate. Please know that not one killing state will receive any money from tourism, vacation rentals etc.. from my family or friends. I will not purchase products produced there. This war on wildlife and wilderness has to end. Enough of welfare ranchers and big money corporations using and destroying our public lands.